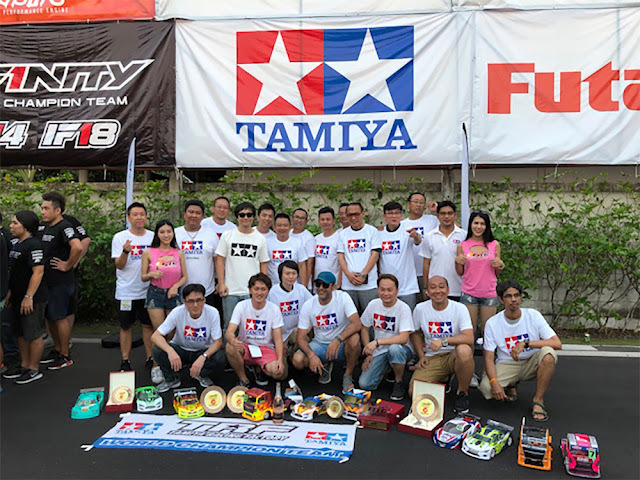 The Tamiya TRF Team attended the Thailand International Touring Car Championships (TITC) to support the Tamiya racers at the track, and to also have some fun racing themselves. 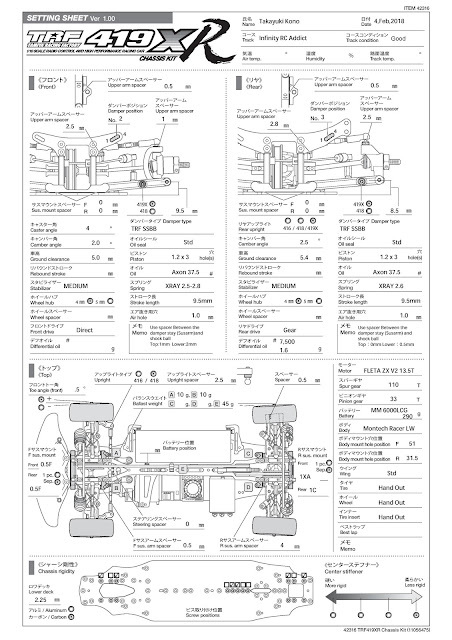 The following info is from Tamiya, including the set-up sheets from the Factory drivers and a nice little bit of info. 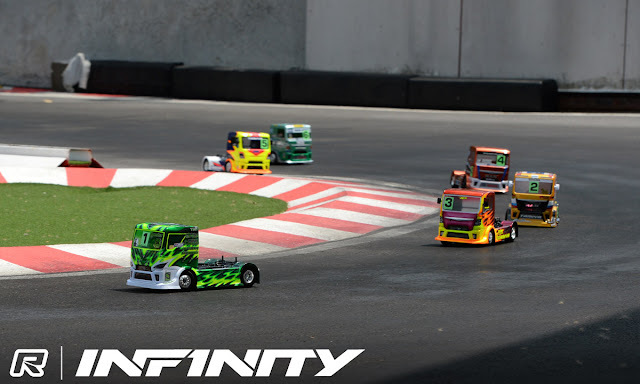 Held like last year at the Infinity Addict Circuit located just 30km from Suvarnabhumi Airport, the Thailand International Touring Car Championship (TITC) is one of the largest R/C events of its kind in Asia. 219 drivers took part in this year's running, across five classes: F1, Non-Boost, Tamiya Truck, Open Brushless and Modified. With rules limiting the optional parts available, this class was a great choice for all-comers: highly popular Tamiya R/C racing truck models fitted with stock Torque-Tuned motors distributed at the track. Motors were shuffled among the drivers for the finals, ensuring a level playing field and some great action that enthralled the onlooking crowd. 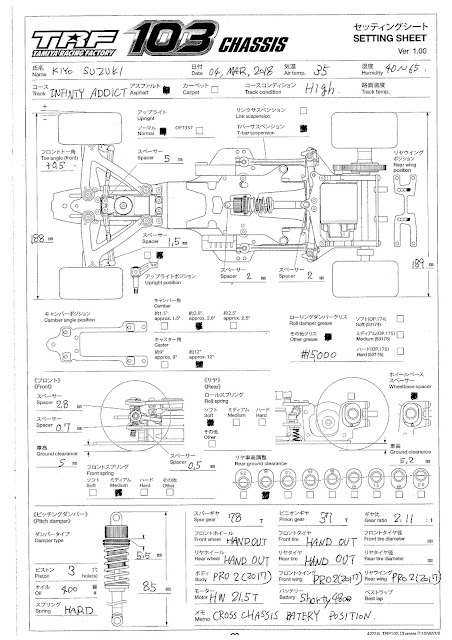 Kiyokazu Suzuki gave the recently-announced TRF103 chassis kit its bow in a public Open Class race, piloting it to a respectable 5th place finish. Feedback from the pressured race environment will be invaluable in the development of future TRF products. Here is Suzuki's setting sheet. 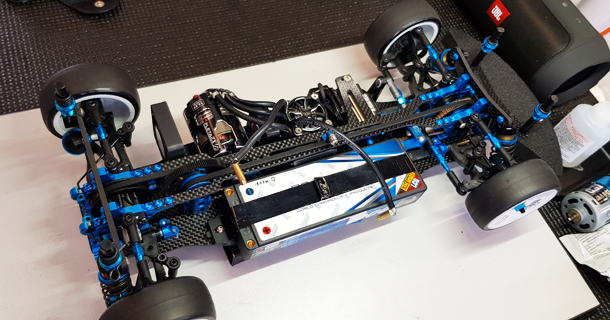 This class saw the most Tamiya chassis entrants of the weekend, and Kono was on hand to give advice, as well as run the TRF419XR with a number of potential Hop-Up Options still in the development process. A friendly atmosphere abounded as Kono shared his setup with Tamiya drivers, and he made a real impact on the field, bringing the car home in 3rd overall. 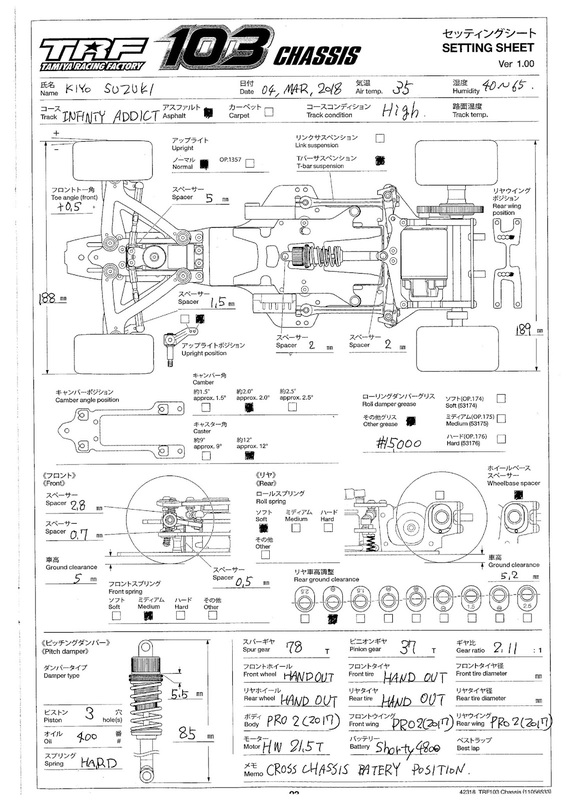 Good to see Tamiya supporting their racers at the event, and it is also encouraging to see that there are still new parts being worked on for our TRF419XR's. Hopefully we will see Kono or Suzuki in Europe some time, and also at the worlds.